Standing at the baggage carousel, I shifted my weight. The machine spit out bags at random intervals. Each time the rubber curtain moved, dividing the interior machine from the belt, I held my breath. Perhaps my bag would be the next lucky one spinning from the machine’s dark mouth. One by one, the crowd surrounding me hauled their bags from the conveyer belt until it was only me and three others still waiting, anxiously watching the conveyor belt. It kept churning out empty air with a straggler bag occasionally popping loose, its the owner sighing in relief. My watch said I’d already missed two trains headed downtown. As silly as it seems, I felt like the last kid selected for a softball team. The kid that couldn’t hit a ball to save her life. All because of a bag filled with stuff that I believed would make or break my trip. Finally, my black suitcase broke free of the rubber curtain. Hauling it off the conveyer belt, on my way out to catch the next train, I intentionally hit it on a few sharp corners. I hate waiting. For anything. That’s why I now pack in a carry on. When the plane lands, I simply pull my bag down from overhead storage, sling it over my shoulder, and catch the first train. Forget about waiting. To make that possible, I mined my existing closet for clothes to fit my new carry on lifestyle. Just because you’re a woman, that doesn’t mean you have to overpack. Have you ever wanted to pack as light as any man, still look good, and not have to buy a new wardrobe? By the end of the guide, you’ll have a selection of clothes to mix and match which complement each other and will pack lightly for your next trip, in your carry on. Chances are you wear the same favorite clothes over and over, with some variations on pants or jackets. These are the clothes you want to take on your next trip. Move your entire wardrobe into an empty closet. Over a couple months, move only the clothes you wear back into your main closet. Congrats, your favorite clothes, those you most often wear, have now been identified. Rotate your hangers so the hooks face you, rather than facing the closet’s back wall. Over a couple months, as you wear your clothes, switch the hangers of the worn items so that they face the correct direction. After a few months, you’ll have a good visual of exactly which clothes you regularly wear and which ones just take up space in your closet. What does double-duty mean? These are clothes that you can layer, easily wash, and which complement each other. Cliche, but true: layering clothes is the simplest way of dressing appropriately for any type of weather. Peel off a layer when it’s too hot, or add a cardigan when you’re cold. Ball up the clothing to see how small it can become when you pack it. Next up, check the tags to cull out any high-maintenance clothes that need to be dry cleaned, ironed, or wrinkle easily. Typically, a patterned button-down shirt will hide wrinkles better than a solid color. Also, try to select shirts with rayon or polyester in them to help them keep their shape after multiple wearings. Make sure the fabric can take a beating. To me, that means no white, as I’m the girl who manages to get food stains on any white clothing. Your clothes need to hide the rigors of travel and make you look good. Chances are you’ve already figured out which clothes do that just from living your daily life. Your tank tops and cotton shirts will be pulling heavy duty, so, you need them to flatter your other clothes. When packing, select shirts in colors that compliment each other. For example, my closet has lots of blue t-shirts, so I typically pack black and pink tank tops. I know the two colors look good together. And, if needed, I can wear the black tank top on its own. Adding in a scarf (which can ward off chilly winds), or a statement necklace, can change an entire outfit’s look from casual to dressy. Best part is these small accessories don’t take up tons of space in your bag. And if you’re like my friend — her entire outfit is built around her jewelry — you can wear almost the same outfit every day, but make it look totally different based on your accessories. Get creative! Congratulations, you’ve now pared your closet down to a choice selection of your own clothes to bring on your next trip! 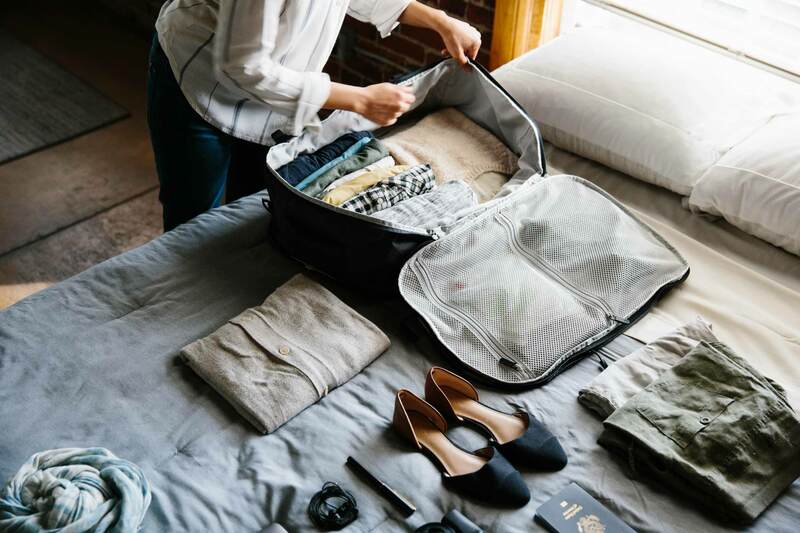 When you pack for your next trip, pack from this selection and pick clothes — short sleeve or long sleeve — depending on your destination’s weather. Let’s be honest: I hate folding and ironing clothes almost as much as I hate waiting. What I’ve found works best for my clothes is rolling them. 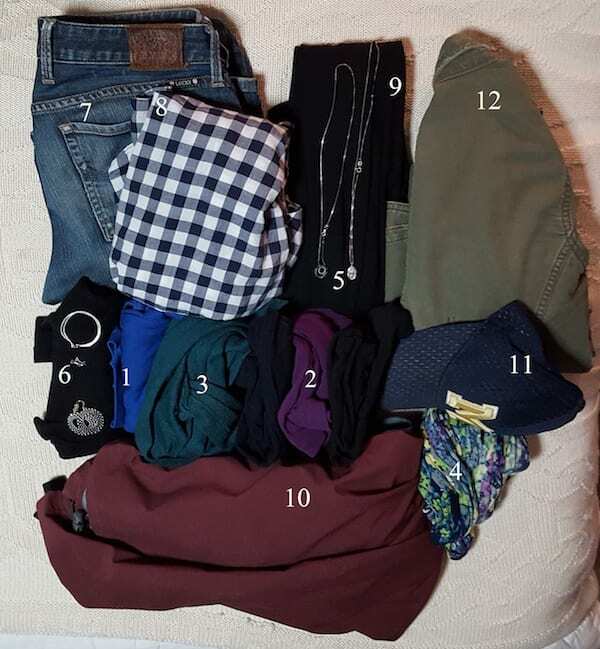 With this method, you can see all shirts at a glance, use minimal space, and you can pull out shirts without messing up the general organization of your bag. Packing like this is much easier with a bag that unzips from the top, like the Tortuga travel backpacks do, than a normal hiking backpack that opens only from the top. As a woman, you can pack in a carry on and still look good; without buying a new wardrobe for your trip. Remember to select items of clothing that layer well, compliment each other, and easily wash. Skip high-maintenance clothing that needs to be dry cleaned or ironed. Using these tips, you’ll travel with several outfits from a few select items that you already own and make you feel amazing.